As Jonathan Swift put it in 1738, “he was a bold man that first ate an oyster”. That first brave leap into consumption is easy to imagine when you’re holding a freshly shucked oyster in your hand, the slimy flesh swimming in seawater. There’s a lot to put people off about a raw oyster. The first timer eyes the delicacy with suspicion, will often pause, may even refuse a couple of times, but will eventually knock it back, a horrified expression fleetingly crossing the face. That first oyster is very often the last, but more often, it’s the first of many, and it won’t be long before the newly initiated tries a French Atlantic oyster. Most of northern France’s oysters are farmed along the Brittany coast, and the port town of Cancale is the centre of the industry. 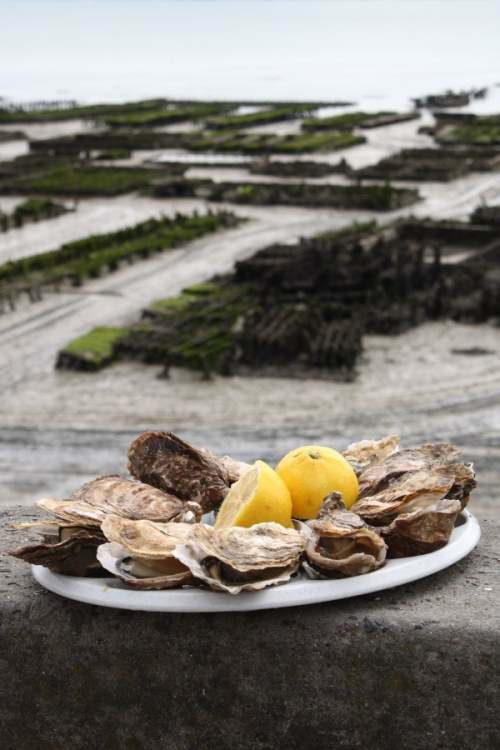 Twenty-five thousand tonnes of oysters are produced every year in Cancale’s waters, close to the sea wall in vast beds, collected at low tide by tractor. 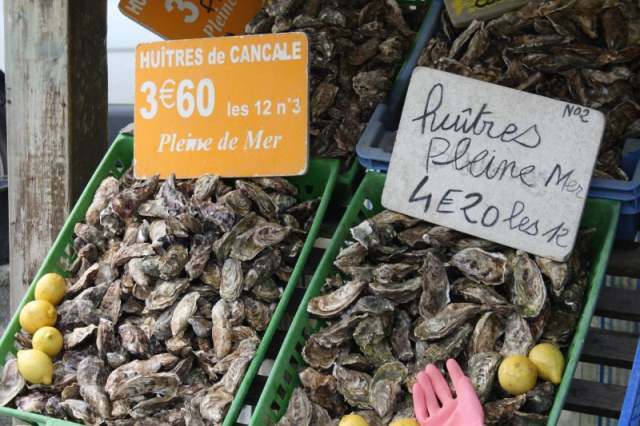 Some oysters find their way into the town’s smart restaurants, others have found their way as far as Louis XIV’s plate at Versailles, but more are eaten from plastic plates by people sat on the low sea wall. Oysters are greedily slurped down with nothing more than a squeeze of lemon and the shells thrown casually back over the wall. At low tide, the town is filled with the gentle clatter of discarded shells landing on thousands of other shells on the foreshore. Cancale’s oyster stands are very cheap and are the best way to sample a few of the town’s finest. A dozen oysters cost between three and four Euros, depending on size, with an extra fifty cents each for shucking and a lemon. Lunch comes in at under five Euros. The stallholders, wearing a chainmail glove and wielding a stout knife with a practiced ease, know exactly what they’re doing, and open a dozen oysters in the time it’d take me to do one. The oysters are superb, large, with a subtle nutty flavour and a clear, salty brine. Even so, there’s a limit to the number one person can eat at a time, and as you can just about see below, I found that limit. I'm up for eating everything and as much as I try and try with oysters, I still can't stomach them! Always feel like a foodie failure for it too! I've only had raw oysters once — or oyster (singular), I should say. It wasn't something I went wild over, but I'd like to try again, especially if it's super-fresh like the ones you had. a dozen oysters for under 5 euros. Very affordable lunch:) Great story. Thanks for sharing. I felt in love Cancale, Brittany and Normandy, I was there last January! Do you prefer "creuses" or "plates" oysters? Great post, I could just about smell the sea and taste the oysters. Have you read Bourdain's description of eating his first oyster when he was a kid? He was visiting his French relatives, one of whom was an oyster fisherman. He gave Bourdain one to eat right out of the sea. It's a great passage. In Hong Kong, guess one oyster of the similar type shall cost about 3Euro (I mean buying from decent supermarkets). Thanks for feeding my eyes. Considering that I live in a landlocked place, I don't have the opportunity to eat raw oysters very often. But when I do…yum! Especially small ones with a little horseradish. Great post! Great post! I love oysters! Cute post. Bold man to eat an oyster? Ha. I think not. If that is the definition of bold, oy, we are in trouble. Great post on oysters! I have to admit, I cannot stomach a raw oyster. It's not going to ever happen. Any raw seafood or meat grosses me out. I'll eat that stuff cooked, TYVM. For all of the reasons you give, and more, I shouldn't like oysters as much as I do. I can't even take a raw tomato (oh, the horrible, horrible tomato guts). But I love 'em. Really I do. Once, in a farmer's market in Portland, Main, I asked a fishmonger about the difference between the varieties he had on sale. So he opened three for me on the spot to try, gratis. Now, that was a great moment. Nice post, mate. Very evocative of the region.